Barbecue Master: Top off that barbecue grilled steak with some peanut butter fudge. YUM! Top off that barbecue grilled steak with some peanut butter fudge. YUM! We had grilled steak last night using my favorite barbecue steak recipe. I started making steak this way back in college which I must say is quite a few years back though I won't say how many. Really, I'm just too lazy to do the math. Let's just say that I was at NC State when they won the basketball national championship in 1983 under Valvano. In any case, everyone thought my steak rocked back then, and they still do. I decided to get lazy and just tossed the charcoal in the grill. After throwing dry grass and paper towels on the charcoals with lots of lighter fluid (ugh), I remembered why I recommend using barbecue chimney starter - an inexpensive and very handy grill accessory. Next time I grill (which will be soon I'm sure), I'll do it right and not dink around for over a half hour getting the fire going. We hadn't had anything homemade sweet in a while, since it's been hot. My air conditioner does not do the trick when the temps hit the 90s (F). My boys were at the begging stage. Since fudge is a stovetop dish and pretty quick, I decided to make a pan of my Easy Southern Peanut Butter Fudge. That did stay in the house and not outside in the heat, but it sure was a nice treat after our grilled meal. In fact, the whole pan was gone in two days, and I only had two little pieces. 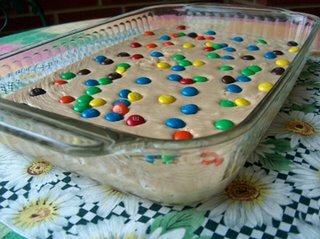 My kids go wild for this fudge, and it's always a favorite at pot luck meals. No one would ever guess it's so quick and easy to make. Barbecue Ice Cream - Now that's just GROSS!